Building electrical system installation, troubleshooting & repairs & electrical hazards. Guide to articles describing residential & light commercial electrical systems: installation, inspection, diagnosis & repair. How to install, inspect, & troubleshoot building electrical systems, appliances, components. How to detect & report electrical hazards, defects in residential and commercial electrical panels, switches, fixtures, electrical wiring & grounding systems. Proper electrical repair methods for unsafe electrical conditions. Safety for the electrical inspector, aluminum electrical wiring hazards, how to determine service voltage and ampacity, how to inspect electrical panels, and significant electrical hazards of Federal Pacific Electric Stab-Lok breakers and panels, Federal Pioneer product warnings, certain Square-D product concerns, Zinsco and Sylvania circuit breakers and panels, multi-wire branch circuit protection, inspection and repair of low voltage wiring systems, and proper installation of lightning protection systems on buildings are addressed. Also try the page top or bottom SEARCH BOX as a quick way to find information you need. This page provides an index to key building electrical system topics addressing electrial system or component installation, inspection, troubleshooting & repair. We also disuss electrical and electrical inspector safety, testing, standards, and controls. ALUMINUM WIRING Information Website Aluminum Electrical Wiring Hazards and Repairs: in-depth authoritative info, photos, documents including selection of proper vs. ineffective repair methods. E.g. : Ideal 65 "Twister" purple connector fails in field and lab testing with aluminum wire. ARC FAULT CIRCUIT INTERRUPTERS: what are they, how do AFCI's work, where are they required to be installed? Also includes notes on GFCI's and the 2008 NEC electrical code. CHALLENGER ELECTRIC PANELS - bus overheat field reports in Challenger® electrical panels, relation to FPE Stab-Lok®? CIRCUITS, ELECTRICAL: electric circuit basics for homeowners, electrical shorts, definitions of AC/DC, watts, amps, volts, etc. CODE BASICS, ELECTRICAL electrical code information for homeowners. Can I do my own wiring? CONDUIT, ELECTRICAL: information for homeowners & home inspectors. CORROSION & MOISTURE SOURCES in PANELS, Roger Hankey 2010, and CORROSION in ELECTRICAL PANELS, Daniel Friedman, 1992, 2009, discuss the sources of water or moisture intrusion in electrical panels and causes of rust or other safety concerns. ELECTRICAL PANEL INSPECTION CLASS safety for electrical inspectors, electrical panel, fusing, wiring defects, defective products. "Inspecting Residential Electrical Panels," Daniel Friedman, HVASHI, September 12, 2002 Annual Seminar. DIRECTORY OF ELECTRICIANS: if you need to hire an electrician with special skills or familiarity with aluminum electrical wiring, FPE Stab-Lok replacement panels, Zinsco replacement panels, etc. here is a directory of professionals. ELECTRICAL SYSTEM REPAIR FAQs - diagnostic questions & answers about inspecting or repairing electrical systems in building: wiring, fixtures, receptacles, electrical panels, lights, light fixtures, GFCIs, AFCIs, etc. ELECTRICIANS DIRECTORY - how to find an electrician who knows proper repairs for aluminum wiring, FPE panels, Zinsco panels etc. EMF RF FIELD & FREQUENCY DEFINITIONS - defines and explains electromagnetic field (EMF) or electro-magnetic radiation EMR and related terms such as EMF, radio frequency - RF, hertz or cycles, megahertz, medium frequency MF, very high frequency VHF, ultra high frequency UHF, megahertz MHz, gigahertz GHz, terahertz THz . FEDERAL PACIFIC ELECTRIC (FPE) PANEL Stab-Lok Circuit Breaker Panel Hazards Latent fire hazards, in-depth authoritative research, documents, advice on Stab-Lok electric panel and circuit breaker failures and what to do when this equipment is found in buildings. FLICKERING LIGHT DIAGNOSIS - what causes flickering lights, voltage fluctuations, and similar electrical problems & how do we find and fix the trouble? FPE STAB-LOK PANEL IDENTIFICATIONS - is yours one of these? ALSO: A History of the FPE Stab-Lok Issue. FEDERAL PACIFIC ELECTRIC PANEL REPLACEMENTS two cost and method options for FPE panel replacement. LOW VOLTAGE WIRING REPAIR & REPLACEMENT GE®, Remcon, Sweepe, Bryant, Sierra, other brands, and newer Touch-Plate® low voltage wiring systems. Low voltage lighting switches, relays, transformers, transconverters. 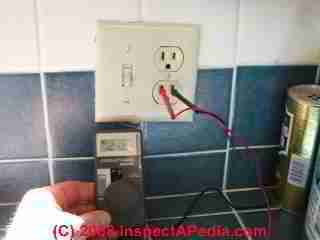 OUTLET, HOW TO INSTALLl: guide for home owners & home inspectors - it's easy but important details make the difference between a safe installation of an electrical receptacle and one that is both dangerous and illegal. Reader Question: Can I Hook Up Two Power Sources to One Electrical Panel? By "possible to connect two sources of Electricity to one Sub-Panel" I presume you don't mean is it physically possible to connect two power sources to a single electrical panel since that would be trivial to accomplish; Rather I presume you mean is it acceptable practice or is it "safe" to connect multiple power sources into a single electrical panel or sub-panel. The basic answer is no. In general it is very dangerous to have multiple sources of power into a single panel or subpanel because of the possibility of backfeeding and shocking someone who thinks power is off from a given source. So we don't hookup simultaneous live electrical power sources to a single electrical sub panel or main panel. We do not hook up multiple electrical power sources to a single electrical sub panel without using an isolation switch. In our photograph of an isolation switch hook-up (above left), the main electrical panel (1) is at left. 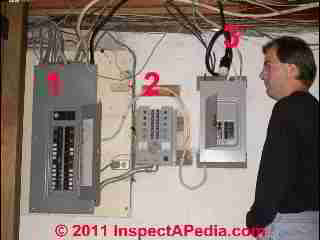 In the photo center is an isolation switch (2) that allows the homeowner to switch individual circuits from being powered either by the main electrical panel's service entry mains or by an electrical generator (located outdoors) that is connected to the isolation switch by a removable plug shown hanging on the wall (3). You can see the receiving plug receptacle at the bottom center of the isolation switch (2). The sub panel shown at right (next to our client) was an addition to the original electrical system to support central air conditioning and is not part of this discussion. Watch out: Emergency backup electrical generators produce 120V and 240V which may cause fatal electrical shock if precautions are not followed. DO NOT under any circumstances connect your electrical generator to any circuit or receptacle that is receiving electrical power (home, office, etc) from any other sources as this is likely to result in a fire and damage all electrical systems and could also shock someone working on the system. Our auxiliary electric generator photo at left shows a backup "home" generator that the owner had set up to keep a basement sump pump working. Some owners connect an extension cord to the generator's electrical supply receptacle and connect the other cord end to a tool or appliance - which may be safe. But using that same extension cord to "back-feed" a home electrical circuit without an isolation switch is unsafe and should not be done. Other key safety warnings include the warning that the backup generator should not be operated indoors nor in an enclosed area - there are fire and also potentially fatal carbon monoxide hazard risks. Note that other safety precautions also apply - be sure to see the instructions provided with the generator. See BACKUP ELECTRICAL GENERATORS for complete details. Reader Question: History of Electrical Wiring in the U.S. - Split Receptacles or Electrical Outlets? When were houses commonly built with split outlets/receptacles? I am doing research to find out how many houses in the US may not have them. Thanks! - Maria S.
You are referring to the practice of providing separate power from separate electrical circuits individually to the upper and lower receptacle openings of a duplex electrical receptacle. Grounded electrical receptacles date to around 1915, though they were by no means in widespread use until much later. Because sources (Wikipedia and others) note that the dominant way to plug in electrical appliances was by connecting them (using the screw-in adapter) to light bulb sockets into the 1920's (in North America) it is reasonable to argue that it was not until the mid or later 1920's that duplex electrical receptacles began appearing in homes. Labre patented the grounded plug in 1928. Ten years later, twist-on locking electrical receptacle connectors date to Harvey Hubbell way back in 1938. Ring circuits (adopted only in the U.K.) first saw use in the U.K. around 1947 - provided the functional equivalent of our split wired receptacle approach and suggest the history of origin of the idea. The sum of this history to date (subject to revision as our research continues) is that I'd place duplex receptacles in widespread use by 1935-1940 and it would be fair to assume (barring a code restriction yet to be found) that split wired receptacles, being physically possible, appeared in some uses as early as 1940. IN sum it is more likely that split wired electrical receptacles were in use by the late 1940's, expanded during the post-Korean war boom, and began seeing widespread use in North America after 1965-1970. That last OPINION derives from guessing at the onset of surge in use of multiple electrical appliances at once in home kitchens. Continue reading at ELECTRICAL DEFINITIONS or select a topic from closely-related articles below, or see our complete INDEX to RELATED ARTICLES below. ELECTRICAL INSPECTION, DIAGNOSIS, REPAIR at InspectApedia.com - online encyclopedia of building & environmental inspection, testing, diagnosis, repair, & problem prevention advice. Questions & answers or comments about building electrical systems, panels, breakers, wiring installation, inspection, diagnosis, & repair. Roger Hankey is principal of Hankey and Brown home inspectors, Eden Prairie, MN. Mr. Hankey is a past chairman of the ASHI Standards Committee. Mr. Hankey has served in other ASHI professional and leadership roles. Contact Roger Hankey at: 952 829-0044 - rhankey@hankeyandbrown.com. Mr. Hankey is a frequent contributor to InspectAPedia.com. ASHI Technical Journal, Vol. 3. No. 1, Spring, 1993, "Determining Service Ampacity - Another Consideration," Robert L. Klewitz, P.E., with subsequent updates and additions to the original text ongoing to 2/19/2006. Reprints of the originals and reprints of the Journal are available from ASHI, the American Society of Home Inspectors www.ashi.com. Kenneth Kruger: Original author of the sidebar on testing VOM DMM condition: Kenneth Kruger, R.A., P.E. AIA ASCE, is an ASHI Member and ASHI Director in Cambridge, MA. He provided basis for this article penned by DJ Friedman. Wikipedia provided background information about some topics discussed at this website provided this citation is also found in the same article along with a " retrieved on" date. NOTE: because Wikipedia entries are fluid and can be amended in real time, we cite the retrieval date of Wikipedia citations and we do not assert that the information found there is necessarily authoritative. MCA online [tests performed while the motor is operating] can be further split into two categories - current analysis and voltage analysis. Current analysis is primarily focused on the rotating components. Loose or broken rotor bars, cracked end rings, rotor eccentricity, misalignment and coupling/belt problems are some of the "big-hitter" failure modes detected in the current signature. Power quality issues like harmful harmonics, voltage imbalances and under/over-voltages are among the issues identified with voltage analysis. MCA offline is most famous for the resistance-to-ground measurement. But other measurements make motor circuit defects easy to find. Measuring electrical characteristics like impedance, inductance and capacitance tell the analyst plenty about the condition of the windings. Inductance is a great indicator of turn-to-turn shorts. Capacitance to ground measures the amount of winding contamination (water, dirt, dust, etc.). Changes in each of these affect impedance (total resistance of an AC circuit). These characteristics are measured phase to phase and phase to ground and compared to each other and to percent change from baseline to identify motor circuit defects. Motor circuit analysis (MCA) is often and easily confused with motor current analysis (MCA), which is an abbreviated version of motor current signature analysis (MCSA).